My love affair with cinema began quite early. Coming from India, the land of the world’s largest film producer (yes, they make more movies than Hollywood out there), it was practically impossible that I would not be lured by the silver screen. While I had been attracted to and entertained by cinema since I was a child, I fell in love with the medium a little later. I was probably in my early teens when my father encouraged me to play hooky from school and go see To Sir With Love. In my hometown, most cinema houses screened Hindi (or other Indian) language movies. There was one theater that was dedicated to showing English movies but those would only be current releases. There was this one theater that screened older English movies in the morning slot: the 10 am screening prior to the matinee. To Sir With Love was playing at this theater and like most of the older films, was likely to end its run by the weekend. Now, you have to understand that, in my family, skipping school was akin to committing armed robbery… or worse. You could skip lunch and dinner before you skipped school. So when my father urged me to skip school and see this film, I was certainly intrigued. So off I went, one weekday morning, to see this little gem of a movie from 1967. 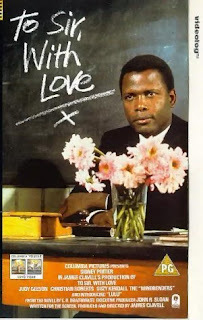 I sat there mesmerized by a solid script, wonderful depiction of London and the powerful presence of Sir Sidney Poitier. Well, let’s just say that my perception of cinema changed that day. I think it was then that I realized the true power of storytelling and the impact it could have. The story of a black London engineer, Mark Thackeray, who turns to teaching a rowdy bunch of white kids as he searches for a “proper” job imparts many lessons for a young mind. Sidney Poitier, in the performance of a lifetime, personifies dignity and wins over the hearts of his students and audience alike. Often imitated but never duplicated, it remains a classic and one of my favorite movies. A random sampling of quotes from this movie gives you some idea of what it is all about. There was one other time when my father (not too long ago after the first instance) encouraged me to watch a movie even though it meant skipping school again. This time, it was an epic movie from 1962 about the real-life story of a British Officer in the Middle East during World War I, Lawrence of Arabia. It was my introduction to “big” movies, one made by the master of grand films, Sir David Lean. It is a big movie in every sense: grand locations, impressive landscapes, huge cast, heavyweight performances and even a very big runtime at over 3 hours. It made me appreciate the grandeur that can be brushed on the silver screen. Unlike some of the other “big” films that I saw later on, (Ben-Hur, Cleopatra, Spartacus and so on) huge landscapes are juxtaposed with close-ups of characters. It is the kind of movie that you start watching and realize before it is over that it has made it to the top 5 list of the Academy Awards. At its heart though, it remains a brilliant character study and Peter O’Toole as T. E. Lawrence established himself as a heavyweight in the field in spite of his slight, almost delicate, frame. Good as he was, O’Toole did not take home the Oscar that year as he lost to a slightly more powerful performance by Gregory Peck in To Kill A Mockingbird. For the record, my father did not sanction any truancies following these and I will never admit to having skipped school to see a movie any other time. But this set me on a course to appreciating good cinema and looking forward to the next good film, be it grand in scale or a small independent movie trying to make its voice heard. And all along, while being entertained, thrilled, pleased or humored, hopefully I have learned a little as well. I love your movie reviews! I am going through a "vintage" movie phase and have recently seen "Mogambo," "Gentlemen Prefer Blondes," "An American in Paris," and "The Barefoot Contessa." I adore Alfred Hitchcock films, too. I haven't seen "To Sir with Love" or "Lawrence of Arabia" yet, so thanks for inspiring me to see these classics. @chandlerguera: Thanks. I hope that you will enjoy these movies. I would also recommend adding "Casablanca" and "Doctor Zhivago" to your list, if you haven't seen these already.